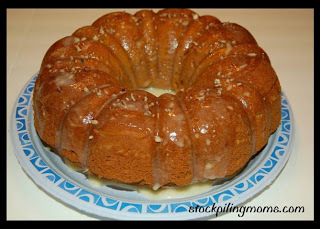 This pumpkin spice cake is so flavorful and perfect for Thanksgiving! Mix cake ingredients. Grease and flour bundt pan. Bake according to package directions. Let cake cool for 15-20 minutes in pan and turn out to cool onto a cake plate/stand. Beat sifted powdered sugar adding 1 TBSP of orange juice at a time until desired consistency (I prefer a thin glaze). Pour glaze over cake. Sprinkle with pecans for decoration. Let stand until glaze is set. Optional: Serve alone or with a dollop of homemade whipped topping.